For the application of colour in industry, it is not only the measurement of colour that is significant, but also the exact determination of colour differences. A customer who places an order with a manufacturer for an article (for example a car) in a particular colour (such as ice-blue) will naturally expect the final delivery to be in that colour (although a small tolerance will obviously be permitted). Unfortunately, colorimetry’s famous CIE diagram cannot be used for determining colour differences as simple gradations on a chart. Indeed, this drawback, which is evident in the excessive representation of green and the bunching of red, violet and blue hues into the corners, has always been the subject of criticism. 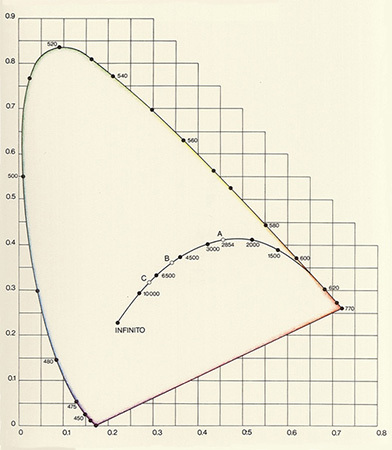 Since the sixties, technical literature has repeatedly proposed simple, usable formulae for the calculation of colour differences, although such formulae have met with varying degrees of acceptance and application. In 1976, a new system emerged, recommended by the CIE and named CIELAB, or CIEL*a*b*. This has since found wide use for non-self-luminous objects such as textiles, paints and plastics. The CIEL*a*b* system appears able to cater for the industrial needs as mentioned. The CIELUV, or CIEL*U*V* system, on the other hand, which was also introduced at that time, assists in the registration of colour differences experienced, for example, with flashes, photography or on the television screen. In order to arrive at the CIEL*a*b* colour-space, the three colorimetric coordinates (colour-values) of X, Y and Z from the CIE Standard Colour Table have been transformed into the three new reference values of L, a and b. In a not entirely simple way, X and Y become a, with b similarly created from Y and Z. Y on its own becomes L (the resulting values being entered into the cube on the left. These will not be more closely explained here). L represents a type of «psychometric brightness» (or lightness). In other words, this parameter is defined by the appropriate function of a psycho-physical value (a colour-value) selected in such a way that uniform steps on the scale will reproduce as closely as possible the uniform differences — which are related in terms of lightness — between colours. 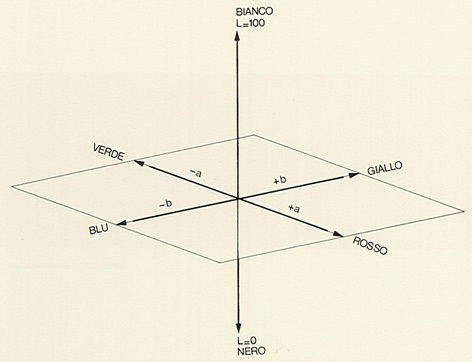 The values of L extend between 0 for black (nero) and 100 for white (bianco). 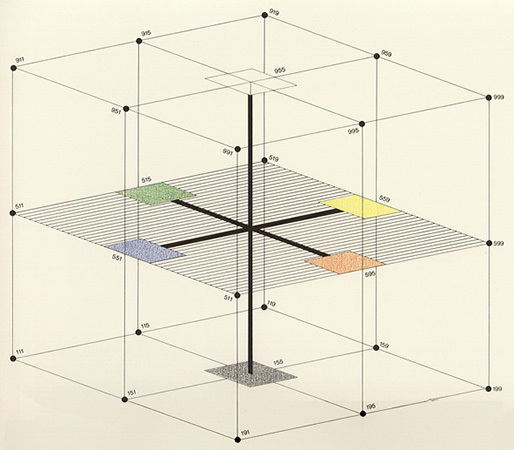 The resultant CIEL*a*b* diagram is sometimes also called the «Psychometric Colour Diagram». Its colours lie at right angles to each other in two directions, and the plane thus created itself lies at right angles to the achromatic axis. The resultant «uniform colour-space» is of course based on of the four psychological basic-colours of red (rosso), green (verde), blue (blu) and yellow (giallo) — first described by Ewald Hering in his opponent-theory — which we now know are transmitted directly to the brain. Date: This uniform colour-space originated in 1976. Bibliography: K. McLaren, «The development of the CIE 1976 (L*a*b*) uniform colour-space and colour-difference formula», Journal of the Society of Dyers and Colourists 92, pp. 338-341 (1976); G. A. Agoston, «Color Theory and Its Application in Art and Design», Heidelberg 1979.